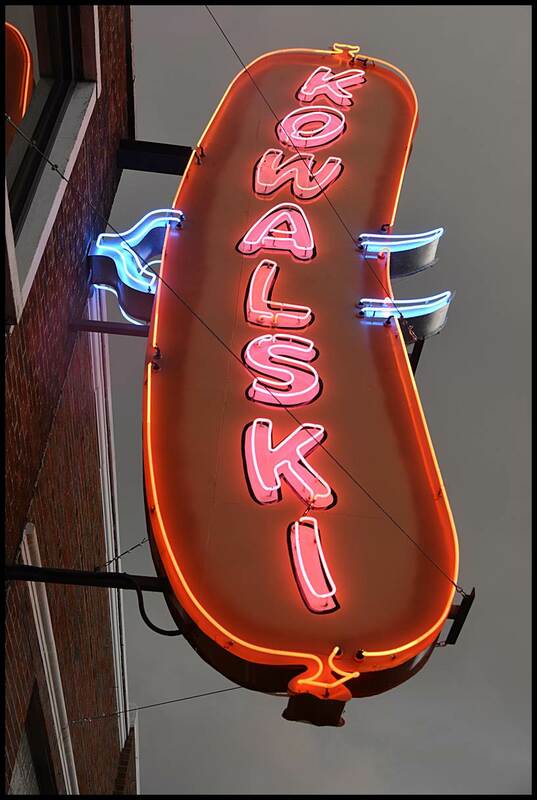 Hamtramck’s most iconic neon sign has recently been refurbished and lights the way to the Kowalski Sausage Co., which is celebrating its 95th year in business. Hammered back into shape, bullet holes removed, and outlined anew with neon piping, the unmistakable sausage-shaped Kowalski sign will once again light the Hamtramck sky, and very soon. In a way, the story of the unlit Kowalski sign reflects the state of the company over the past several years, a time in which Hamtramck’s beloved sausage maker could’ve ended its near-century-long relationship with the city. In 2002, Kowalski bought Home Style Foods and its plant on Edwin. The following year, Kowalski acquired Tasso’s Epicurean Cuisine out of Novi. In 2011, Kowalski bought Hamtramck-based Dudek Foods. This year, Kowalski acquired Toledo-based Consumer Guild Foods. Kowalski said the company had been considering consolidating all production into one plant, which most likely would have meant leaving Hamtramck. The decision to stay was brought about by customer demand for pre-packaged, pre-sliced lunchmeat. Ultimately, the company decided to refurbish and expand its Holbrook plant and hire more employees in order to produce meat products for its retailers, which are no longer the Kowalski delis that used to dot the Metro Detroit area, but superstores like Kroger and Meijer. “Most of the business will go to the sliced meat line, so we’ll need new people and new equipment,” Kowalski said. Plus, with all of its recent acquisitions, the company slogan of “Kowality” no longer applies to meat products. Kowalski now produces 55 prepared food products, which include the pierogi and nalesniki formerly made by Dudek and twice-baked potatoes and the salad and dip product line formerly associated with Home Style Foods. According to Kowalski, the company has had to adapt not only to market changes in Michigan but also to the many states where Kowalski products are now available, or where they will soon be available. Kowalski Company plans to increase its distribution beyond its current areas throughout Michigan, Ohio, Indiana, West Virginia and Kentucky to include Illinois, Wisconsin, Minnesota and Pennsylvania. Products are available for online purchase throughout the 50 states. The company’s founders, Agnes and Zygmund Kowalski, emigrated from Poland to America in the early 1900s and opened a small grocery store on Chene St. in Detroit. By 1920, demand for Kowalski products was great enough to warrant the opening of the factory on Holbrook. The leadership of the Kowalski Sausage Company passed from generation to generation and Michael Kowalski, Corporate Secretary Linda Kowalski Jacob, and Audrey Kowalski, who left the company in 1994, inherited the company in 1989, after their father Ronald Kowalski died at the age of 49. “Between the three of us, we had three years of experience,” Kowalski said. Still, the fourth generation of the family wants to maintain the company’s strong commitment to Hamtramck and the metro-Detroit area. The decision to stay in Hamtramck will mean the hiring of 200 additional employees, mainly in Michigan, and $2 million in improvements to the Holbrook meat-processing plant. “We have had many offers to sell the facility in Hamtramck, mostly from out-of-state companies, but have declined such offers because we want to stay where the roots are and give employment opportunities to those who live in the area,” Kowalski said.